It was a bit more ‘push and shove’ making my way into the Lansdowne, especially being so early in the evening. The meat raffle was in full swing and a bed sheet was neatly draped along one wall of the pub (that’s right a bed sheet). Something was going on. The Fooeys were playing over the P.A. and the bar was swamped as, almost un-noticed, the band made their way on stage. The P.A. faded down, the band fired up and without a pause or introduction they were into their first song. A clean crisp guitar and a single melodic voice drifted out over the crowd. A band of fans shuffled their way to centre stage and began dancing about. Then the music turned rocky, distorted guitars smashed into the melodic tune. They identified themselves as KANG and hit into the next song. It was like a smack in the face. A grinding punk song spat out of the speakers that could not have had more than 3 or 4 chords in the whole song. KANG were throwing themselves all over the stage and the crowd responded with “OI’S! !” which were part of the chorus response, and that’s when I first noticed how many of these people were here for this band. 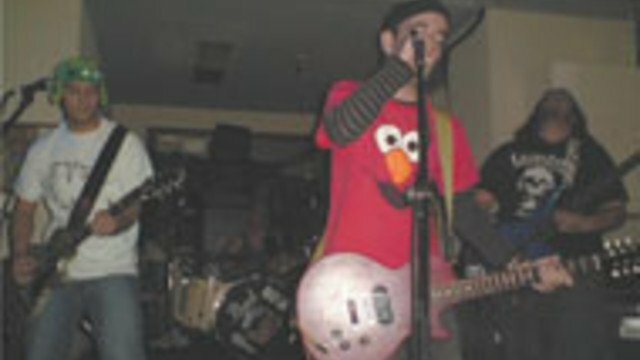 After a quick bit of stage banter the music “switched channels” again into a bopping punk/bubble-gum tune known as “wish u were dead”. Which after building up into a little stress ball of angst melted into an acoustic harmony driven chorus with high angelic voices singing the “wish you were dead” while the band moves became decidedly 60’s bobble head. With the finish of their second last song, some “woots” and incoherent shouts from the audience suggested that they knew what was coming and after a few words from the band they let it all out. The guitars buzzed like ban-saws and the drummer let rip as the band tore into the fastest, punkest version of the Eagles hit Hotel California I ever heard. The crowd shouted and screamed along with the chorus and the band made sure any ounce of energy they had left was moshed out. They finished, and the bed sheet, which had so caught my attention earlier lit up with the band’s film clip of “Captain Afraid of Everything” as they packed up their gear and disappeared into the crowd.